Following the success of our recent All Things Airplane week it felt only natural to move onto another form of transportation. 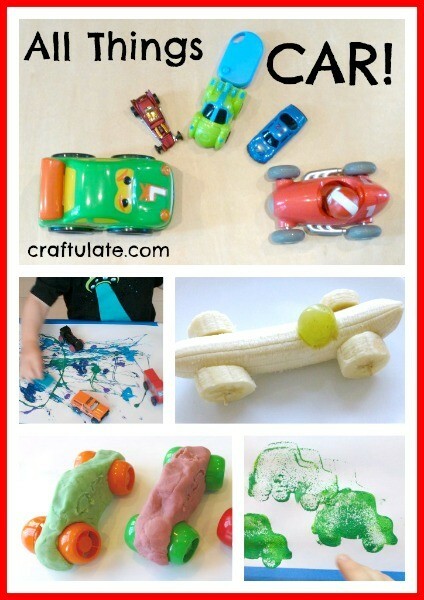 So this week we looked at all kinds of crafts and activities that were all things car! 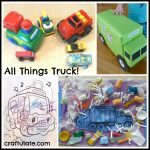 Some time ago we tried painting with a toy truck, and I thought that it was time we revisited this painting technique and paint with toy cars. OK, so afterwards I noticed that a train got into the mix, no idea how that happened! With every theme we do, I always include some colouring. It doesn’t make for the most interesting part of the blog post but it really shows me how much better F is getting with colouring. This is all his own work (picture is from DLTK). 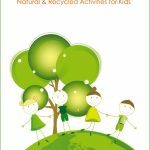 I absolutely love this idea from Inner Child Fun. F so loves his dough at the moment that this was a perfect way to work it into the theme. 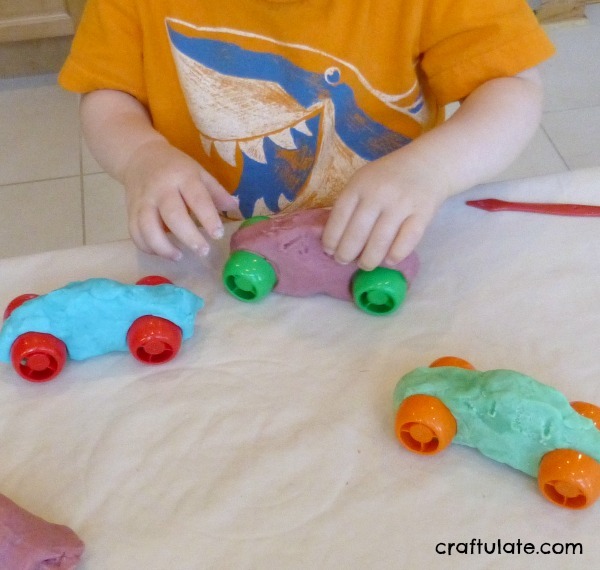 I shaped the cars and then he helped me add the wheels. They slid across the vinyl tablecloth pretty well. Vroooom! Looking for more pouch cap activities? 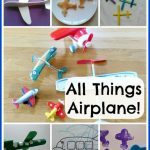 Here are 10 great ideas! 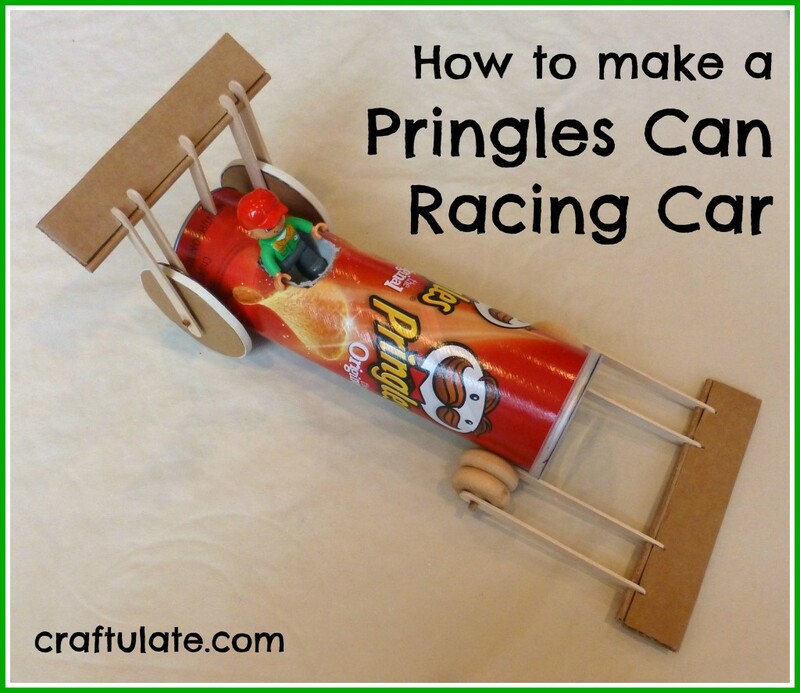 See here for a great tutorial on how to make a car from a Pringles can – written by my husband! I’ve seen lots of versions of these cool cars with markers taped on to the back – not sure who thought of it first but I first saw the idea at First Palette. I taped a long piece of brown paper to the floor and let F loose on it! The pens occasionally went over the paper but I had a baby wipe on hand and the marks came off the floor easily. Pieces of cardboard box are perfect for making into quick ramps for cars! I saw this great idea from BentOnBetterLunches for apple and grape car snacks, and had to try them! My version didn’t look as good as the original but F very kindly said “car!”when he saw them, which is all that matters I suppose! 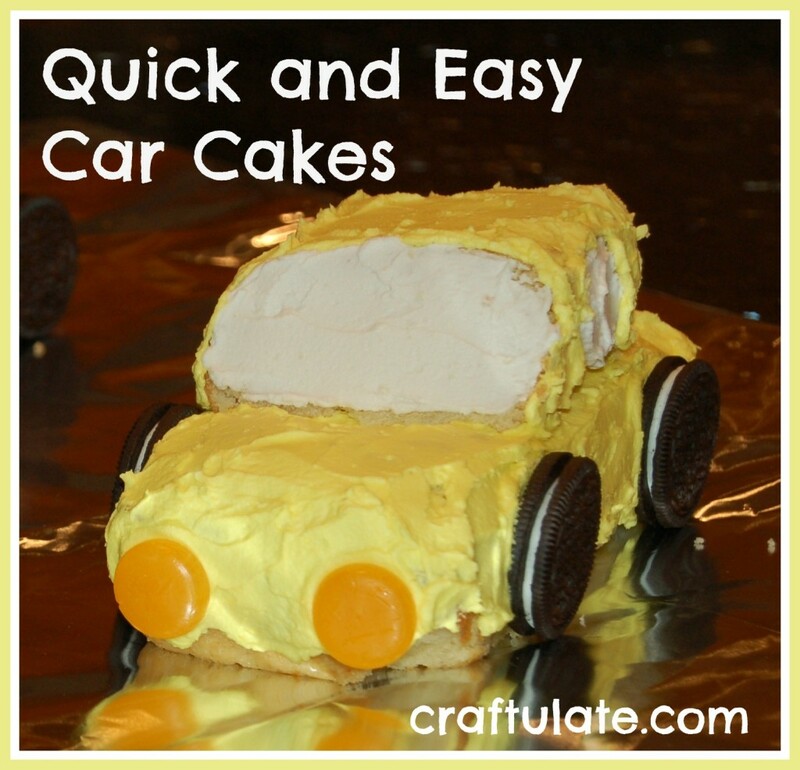 After this I was inspired to make a car using bananas. This took literally 30 seconds to make! F was given this great set made by Alex Toys well over a year ago and he still likes to sit quietly and play with it! 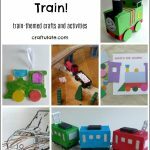 It is great for fine motor skills. 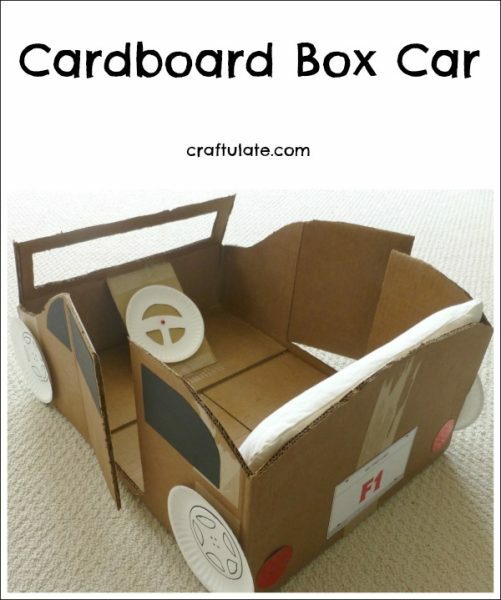 See here for how we made a car from a cardboard box! This wouldn’t normally be a recommended toy for a 2 year old – but as I have just received this set for my birthday it is inevitable that F would want to play with it too! It takes a great amount of control and concentration for him to press the button and make the cars stay on the track. Although it is also a lot of fun when they whizz off the track! This is such a cute little book. There are five different cars that have no colour at first, then when you pull the tab it “magically” has a colour! This book features vehicles other than cars but it is rather fun, with flaps and noises. This is a really cute book with bright, engaging illustrations. I love the banana cars. Reminds me of Richard Scarey. My buddies would love making and eating them!